"Meander through 1819 India with Firangia as he covers villages,jungles and small towns while on a journey of romance, devotion, crime and deception. But there is someone always watching over. This is pre-railways India, when merchants travel in caravans, noblemen with escorts and no road is secure. On his way home after a trade expedition, Firangia's path is crossed by the beautiful Chanda Bai, traveling with a small party of guards. Though a warrior, she wishes to travel under his protection. Should he decline? Read about grandiose ambitions pitted against petty schemes, love and deceit and what in our modern times is termed evil. You will find in this intellectually ambitious, meticulously researched, action-packed historical fiction a broader, age-independent significance." I received this book from 'Think Why Not' in exchange for an unbiased and honest review. When I first read the blurb, I found it quite interesting. 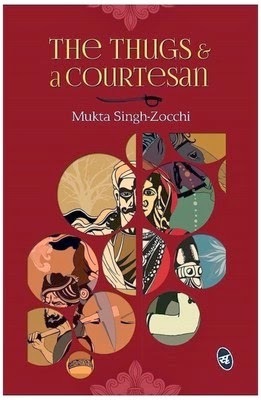 The cover of the book also compliments the era in which the story is set. As is evident from title and the blurb of the book, the book talks about thugs, caravans and courtesans. I found the whole setting of the book quite fascinating and was hoping it to be an exciting and action packed book. However, the book ultimately failed to make a mark for me. There are a couple of reasons why it didn't work for me. First is the writing style. The common thing about books by debutant authors is that most of them write in a very easy language. But, that is not the case with this one - in fact, it is exactly opposite. The writing is way over the top and a bit too self indulgent. There were many instances when I felt the need to look up the meaning of a particular word. That is not exactly a bad thing, but it did interrupt the flow of the story. was not a single one that stood out and made a place in my mind. While the subject of the book is quite interesting, the way it is written doesn't grab the readers attention. I just wish the novel could have been written in a more exciting way.